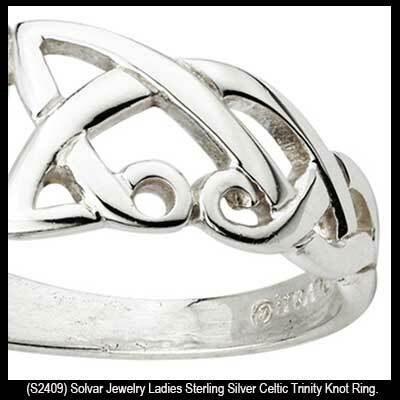 This sterling silver Celtic ring features a filigree Trinity knot nested inside of a teardrop. This sterling silver Celtic ring features two stylized Trinity knots that are enhanced with marcasite stones. 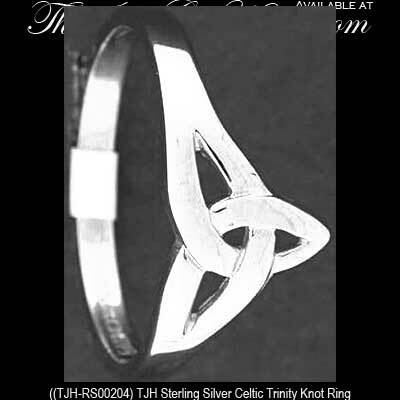 This sterling silver Celtic ring features a double Trinity knot design. This rhodium plated Celtic ring features a green glass stone setting in the center with crystal studded Trinity knots on the sides. This gold plated Celtic ring features a red crystal setting with Trinity knots on the sides. This Celtic ring is made of sterling silver with blue resin accenting and it features the Trinity knot along with a spiral. 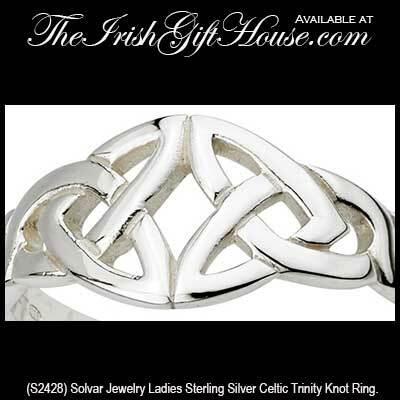 This Celtic ring is cast in sterling silver and features interlaced knot-work. This gold tone Celtic ring features a double spiral design and it is enhanced with an amethyst color glass stone. This silver tone metal Celtic ring features a spiral motif along with gold tone accenting. This gold tone Celtic ring features a double spiral design and it is enhanced with an amber color glass stone. This silver tone metal Celtic ring features a spiral design along with amethyst color glass stones. This silver tone Celtic ring features a spiral design. This gold tone Celtic ring features a spiral design. 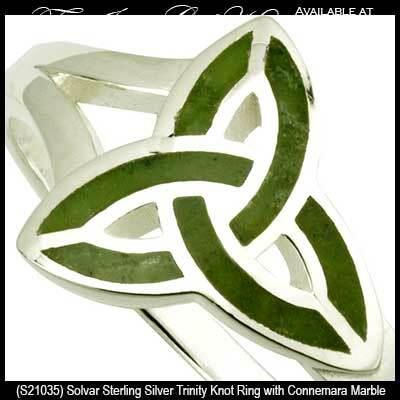 This silver tone metal Celtic ring features the Trinity knot and spiral designs. This gold tone Celtic ring features Trinity knot and spiral designs. This silver tone Celtic ring with gold tone accenting features knot-work and spiral design. This metal Celtic ring features gold tone knot-work and shank and it is enhanced with a silver tone border and an amethyst color glass stone. Naturally we also have a fantastic collection of wedding rings that includes assortments of sterling silver Celtic wedding bands along with Trinity wedding bands. If you wish to browse additional jewelry selections for your fingers may we suggest the shamrock rings or the sterling silver Claddagh rings from our many categories. This collection of rings would nicely augment a sterling silver Celtic necklace or a pair of sterling silver Celtic earrings; this way you would have a complete set of complimenting jewelry that would be fashionable for anything from business to a night on the town. While you are creating your jewelry ensemble you may also wish to browse our vast assortment of Celtic bracelets. The Irish Gift House offers this stunning wrist wear as charm and link designs along with wire and cuff bangles. All this fine jewelry is made in Ireland and hallmarked by the Irish Assay Office at Dublin Castle. 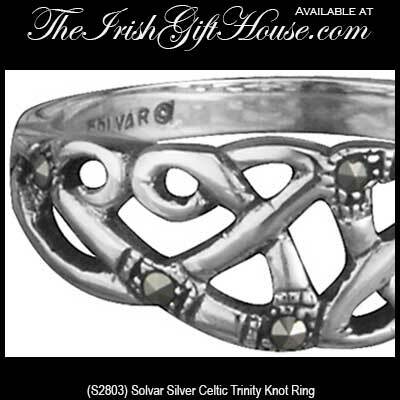 The Irish Gift House features Celtic rings from Solvar with additional designs from Tara and TJH.